I'm headed home this weekend for the first time in 2 months. Considering how relatively close I live--this has been quite the length of time away from home. Needless to say I am ecstatic. Tanya and Taylor will be coming along for the ride. Tanya has already experienced the Harrison household, even during rodeo time, so she is already accustomed to the chaos. I've been trying to think of a way to prepare Taylor for what she is about to face. I keep throwing out random facts about my family (more like scary stories). I've tried to describe the dinner table conversations (80 decibels louder than they should be), or the insane games of "Pounce," or the races for the bathrooms. I realized I wasn't even skimming the top with these stories. If I told her more she would start to cry and lock herself in her room. I'll let her witness it on her own, once she's already stuck. The more I thought, the more I realized the culprit for a lot of the chaos and laughs. Please see for yourself in the picture below. 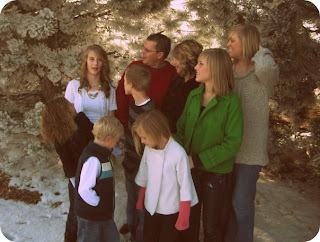 This was taken spontaneously during our family pictures at Christmas time. It speaks for itself.